I just love Easter candy. As a kid, I was very fortunate to be “in” with the Easter Bunny. Our deal-I always got a huge Easter basket as long as I shared it with him! I shared my Easter basket with The Bunny, himself. I was such a lucky kid. He usually came to claim his goodies while I was not around or sleeping, but he always let me know when he came by. I would find empty wrappers in different places and one time he even left his two teeth marks on a cup. (Can I tell you just how long I saved that cup that THE EASTER BUNNY drank from?!!) So you see, Easter candy has a special place in my heart. 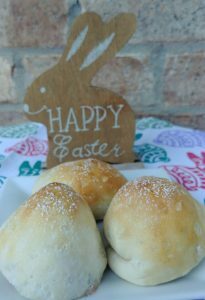 Last year for my Leftover Easter Candy News Segment,, I created stuffed biscuits using many people’s favorite Easter candy, Cadbury eggs. They were such a hit, they were demanded again this year and they were gone in a flash. Imagine a hot biscuit with ooey-gooey chocolate nougat? Get the recipe along with all of last year’s leftover Easter candy treats here. For this year’s, Leftover Easter Candy News Segment, candy filled pop-tarts and jelly bean doughnuts were the the next biggest hits. The doughnuts not only have jelly beans in them but are also flavored and iced with jelly bean “extract”. The same “extract” used in my Jelly Bean Martini. The fun part: Use your favorite color or flavor jelly beans or mix it up. For the jelly bean "extract"
1 tsp jelly bean "extract"
2 tsp jelly bean "extract"
Add jelly beans and water to small glass dish. Microwave on high 30 seconds. Stir until melted, microwave an additional 10 seconds, if needed. Set aside. Spray doughnut pan with non-stick spray. Set aside. In a small bowl, whisk together egg, milk, butter, and 1 tsp of jelly bean "extract". Stir into the dry ingredient bowl until fully combined. Be careful not to overmix. Spoon batter into each cavity of prepared doughnut pan, filling each 3/4 full. Let cool in pan for 5 minutes. Remove to wire rack to cool completely. In a bowl, whisk together powdered sugar, remaining jelly bean "extract", and salt. Gradually whisk in milk until desired consistency is reached. 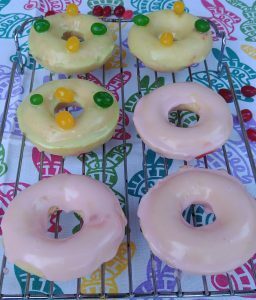 Dip doughnuts into glaze or spoon glaze over doughnuts. Decorate with jelly beans, if desired. Let glaze set for 30 minutes before serving. 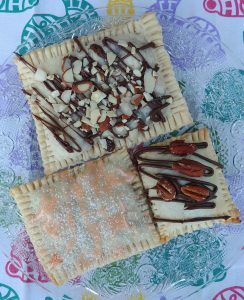 For the leftover Easter Candy Pop-tarts, I used prepared refrigerated pie crust for a super easy and simple “get the kids involved” breakfast treat. Use your favorite candy as a filling. I made mine with Heavenly Hash Eggs, Gold Brick Eggs, and jelly beans. 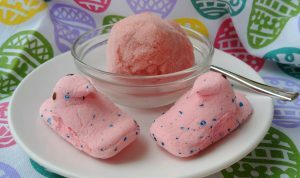 Since I recently enjoyed my Old-Fashioned Soda Sorbet made with marshmallows, I couldn’t help but think about how it would be made with the famous Easter candy, PEEPS. As a PEEPS fan, I was super excited to find Cotton Candy PEEPS chicks at the store. Let me tell you, I am so very glad I did for they made the best sorbet and you can bet I will be heading to the store for some more. Put PEEPS in saucepan. Spoon 1 TBSP of soda over them. Heat slowly on low heat. Using a rubber spatula, fold PEEPS over and over until almost melted. Remove from heat. Continue folding until smooth and fluffy. Let sit for 30 seconds. 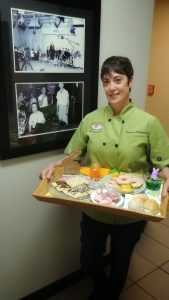 Put On Your TO COOK IS TO CREATE Thinking Cap: There’s so many different types and flavors of Easter candy, especially the gourmet jelly bean flavors, the possibilities really are endless. Just think of leftover Easter candy like any candy and mix it into your favorite cake, brownie, or pancake batters or add it into ice cream. Use Peeps as you would any marshmallow–smores, Krispie treats, or popcorn balls. As a reminder, use the jelly bean “extract” as you would any “extract” or use it to flavor maple syrup or coffee creamer. FOOD FUN: Having an Easter brunch and looking for quick place settings? Make these colorful Edible Easter Grass Treats. 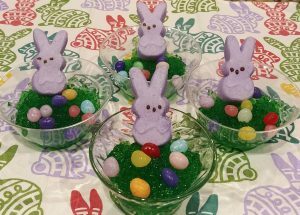 You can make any color “grass” and use any Easter candy for decorations. You can even let the kids design toothpick pendants for names! Get the recipe here. LOVE your tips! We have to plan to have you do a cooking session for the Arts Council! I think it would be a huge hit. Thanks so much and you know I would love to do a session.